Try Continuous Ink System with your Epson Expression Premium XP-600 and make 30 times more quality prints for the same money! Pay only 0.04 USD for A-4 full color print! Create more printouts, pay less! It can be achievable with Continuous Ink Supply System CISS Epson XP-600! Presented device considerably comes down the price of printing and at the same time the copies remain of good quality. Continuous Ink Supply System Epson XP-600 CISS perfectly substitutes any original cartridges. This device allows spending minimum means on printing. The cost of each copy is reduced dozens of times. The price of every printout is several times less, so there is a fair chance to save quite a lot of money on printing. Printing volume averages hundreds of thousands of copies. It's easy to calculate when your purchase justifies itself. 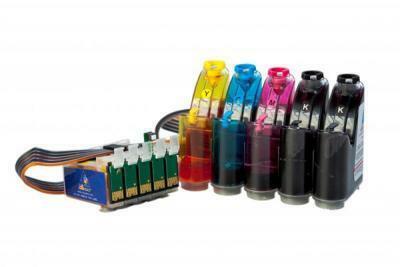 You may order bulk ink system for Epson XP-600 on our web-site is very easy. On our site you can buy CISS for Epson Expression Premium XP-605 for a remunerative price. The device is done to provide the safety of printing device. Continous ink system Epson XP-600 is safe, the assembly is made of a really good quality. Moreover, there is no need to change interior tanks; it means that the printing head is closed for entering the air. That's why any owner is protected against the risk that the most important element of a multifunction device can be broken down. Stable device functioning for printing. Ciss ink system Epson XP-600 is very useful when you need to print great volumes of materials. Comfort in use and practically continuous printing considerably save owner's means as well as time. In addition, considerably reduces the productivity of the multifunction device. On our site you may also buy CISS for Epson Expression Premium XP-700.